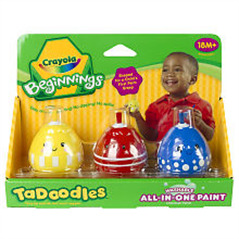 TaDoodles Washable All-In-One Paints are the right size and shape for a child's first palm grasp to help in developing gross to fine motor skills. With their unique design, All-In-One Paints won't dry out and can be reactivated by simply dabbing them on a piece of paper several times. No dipping or spilling! The unique brushes allow your child to experiment with how movements create different lines and swashes. With each scribble, dab, and wiggle, your child's imagination will grow! TaDoodles let your niece or nephew's inner artist come out, and lucky for you there is no spilling, so you can relax and have fun too!